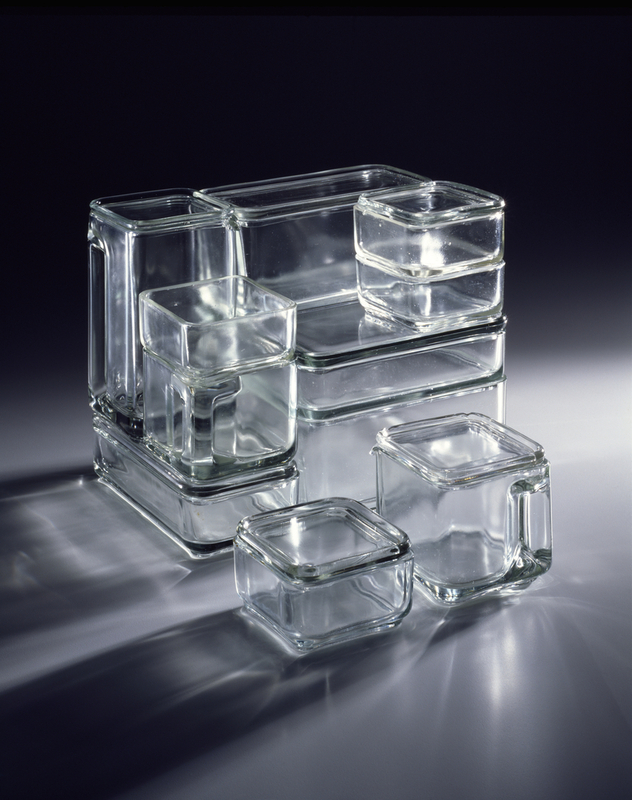 The ‘Kubus’ clear glass stacking and modular storage system was created in 1938 by German designer Wilhelm Wagenfeld (1900-90), who frequented the Bauhaus school in the former Weimar Republic. Kubus, which was manufactured by Lausitzer Glasverein, was one of Wagenfeld’s most well-known affordable designs in pressed glass that he created for commercial and domestic use. He believed that function should not be a determinant of form, but a precondition of good design, and the clean lines and subtle curves, characteristics of Wagenfeld’s work, pay homage to this. Kubus comprises ten individual containers of varying size that nest and stack together. Three of them are shaped like pitchers and have indentations that can be used as handles. Several other square and oblong dishes and covers, complete the set. The modular aspect allows them to be stacked in different ways. This was useful when one considers the fact that Kubus was designed to store food in the fridge, a household appliance that had (and arguably still has) limited storage space. The clear glass of the vessels would have enabled you to determine, in one quick glance, how much food was inside the containers without having to keep the fridge door open for too long, thus preventing cold air from escaping. The design of the ‘Kubus’ set speaks to the growing popularity of refrigerators within the home and changing health and food safety concerns in the 1930s. Was he also the designer of the cubic teapot from this era?